You may have thought that a paper cut was the biggest danger from paper, but what about chemicals? In today’s health conscious society, it’s important to be aware not only of the chemicals in our food, but also of the chemicals that we come into contact with through our skin. If you frequently work with paper in credit card or point of sale machines, play it safe and make sure it is BPA free. Bisphenol A (BPA) is a carbon-based synthetic compound that has been disallowed for use in many items that come into contact with humans. It was once prevalent due to its clear and sturdy structure, but research has linked it to negative health effects including neurological and thyroid functions. From plastic baby and water bottles to metal food containers, BPA was once ubiquitous, but now has been disallowed from use in food products in several countries and reduced to minimal amounts in others. However, the non-food industry has been slower to discontinue use, and it can still be found in reduced amounts in paper products or sports equipment. It’s especially still common in printer sales receipts. While government regulatory groups have deemed lowered BPA levels “safe” for humans, continued scientific studies still cast doubt on this product. That’s why PrinterStock.com offers BPA-free thermal paper for businesses and store owners that are frequently in contact with ply paper receipts. Not only does BPA-free paper have health benefits, but it’s also environmentally friendly by reducing BPA leakage in landfills and aquatic sediment. BPA-free rolls of paper and printers that take such paper have become a large part of the green initiatives of companies around the world. By investing in these products, companies are able to prevent the spread of dangerous chemicals after the papers are thrown away. While this may seem like a small item in comparison to much larger problems with carbon emissions, it is noteworthy that whole landfills are littered with paper that was produced with BPA. To help businesses go green and make safe purchasing decisions, PrinterStock.com carries BPA-free paper in bulk and compatible printer supplies. This helps ensure that a business is taking the right steps towards being a more "green" company. 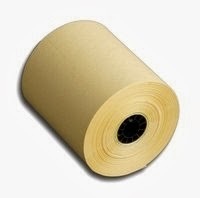 Purchasing these rolls of paper in bulk also helps saving money. Something like the 3 1/8 inch x 230 ft. roll allows for a register to be stocked for a greater period of days with paper that customers can take with them and dispose of without worrying about the impact once it hits a landfill. With 50 rolls in a case, it is easy to see why these rolls of paper are cost-effective and easy for the business to use. With each purchase of these new rolls of paper, a business can be assured that it is doing its part to be friendly to the environment and its customers, while also using quality product that is necessary for normal business routines. Getting on the side of the environment with these BPA-free products helps every business to save the planet, keep their business systems and look good in the process of changing the way they do business. Still have questions about BPA-free products? We’re here to help; contact PrinterStock.com at 866-748-8273.